Is there a little chef in your life that you’re looking for a gift for? Who knows, if you encourage him or her to keep up with her gastronomic hobby, you might be treated to lots of delicious dishes as she gets older! It’s not easy to get kids interested in food, let alone cooking in the kitchen, so an age appropriate culinary gift is a great idea if they already are. We have come up with a nice list of gifts for kids who like to cook and they range in price, so there’s something for everyone. We’ve only picked safe ones that are sure to inspire creativity in the kitchen. We also have some cool gift ideas for male and female home cooks too, so check those out too! While it’s fine for kids to try simple recipes that adults use, it’s more interesting for them to follow ones that are specially designed for kids. The newest edition of the Betty Crocker cookbook for kids includes 66 recipes that cover breakfast, lunch, dinner, snack time and dessert. Each recipe comes wonderfully illustrated, with each step explained so that kids can get comfortable working through every step in the process. They can make mini pot pies, frozen yogurt pops, quesadillas and sandwiches, and even cook mealtime dishes. Kids also learn about cooking terms and techniques, basic nutrition and how to be safe while working in the kitchen. You know that Betty Crocker is a reliable cookbook author, so you can be sure that this is a good bet if you’re looking for a cookbook for kids. 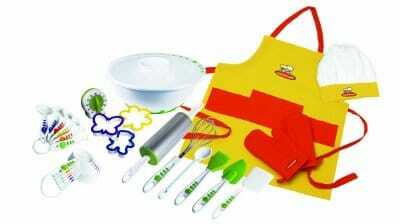 While there are plenty of pretend play kitchen toys available, why not gift them some real cooking utensils for kids? These gadgets, tools and accessories undergo strict safety tests so that kids can’t get hurt while using them but they work well with real food and ingredients. Every cook needs a good set of kitchen tools and the little ones are no exception. This real kids baking set is a 27 piece collection by Curious Chef includes all the basics to get a child started with cooking and baking. Tools included are a kitchen timer, a measuring spoon and cup set, a 3 quart mixing bowl, whisk, a rolling pin, cookie cutters, a cookie turner, poly spoon, silicone spatula and pastry brush. To round up the set, you also get an apron, chef’s hat and 2 thumb mitts. All the tools are of a high quality cooking grade and BPA free and can be cleaned in the dishwasher. They’re sized for small hands but every single one works properly. Even the knife can cut up things like veggies even though the blade is made of nylon and has a blunt tip. The other tools are heat safe and can be used to stir a hot pot or scoop cookies off a hot sheet. Even if a child doesn’t want to actually cook, he can still help his parents in the kitchen by prepping fruits and vegetables for the next meal. By getting kids involved in every stage of meal making, they can develop a love of all foods, especially vegetables. By using the prep tools in this set, he can gain confidence using them safely. This Fruit and Veggie Prep collection includes a vegetable scrubber, peeler, melon baller, a medium nylon knife, large silicone spoon, apple slicer and a bonus sticker set. There’s even a shopping menu to take with you to do groceries. Ergonomic and sized for children’s hands, everything is BPA free and dishwasher safe. If the little one is not yet old enough to try stovetop cooking or baking, she might find pizza making easier and more interesting. She might also appreciate the healthier homemade alternative. This pizza making kit includes a pizza cutter and server, a cutting board with nylon knife, a silicone spatula and stickers with a shopping list for all the necessary ingredients. As with all Curious Chef products, all these tools are heat safe and dishwasher safe and work just like adult sized kitchen tools. However, these are made just right for little hands with the cutting edges made of safe nylon. Having an Easy Bake Oven is a rite of passage for most kids as it is a mini oven that can be used to bake small batches of cookies, cakes and other delicious treats. The appliance is made of high quality food grade materials and comes with a baking pan and spatula and a chocolate chip cookie mix with instructions to get you started. Once the included mix is used up, there are other exciting mixes that can be bought separately. This Easy-Bake Ultimate oven has an on and off knob and digital clock and a heating element very similar to a regular electric oven. Kids will need adult supervision while using it and there is no auto shut off, so it’s advisable to use a separate kitchen timer to remind you to turn it off once baking is done. It’s not absolutely necessary to use only Easy-bake mixes in this oven. As long as you keep batch sizes to a minimum and only experiment with very simple recipes, the baked goodies will turn out fine. Don’t expect this to work exactly like a regular oven. There is no light bulb so you can’t see the treats baking. The heating element is not as strong as a real appliance one, so baking takes time and you can’t make regular size cookies. This is really for very young kids that can’t use a regular toaster oven. This gift idea is not actually for kids but what it does and how it does it makes it just perfect for kids too. The Zoku Slush and Shake Maker is a great inexpensive and simple to use tool that both adults and kids alike can use to make 8 ounces of their favorite slushes and shakes using ingredients like blended fruit, flavored milks, fruit juices, etc. The inner cup is a freezable core that needs to be first cooled properly in the freezer. Once it is cold enough, you take it out and put it into the protective outer cup and then fill the inner core with the desired ingredients. Mix, stir and scrape it all thoroughly with the included special spoon and watch it slowly freeze or thicken into your favorite summer treat! It takes about 7 minutes to turn liquid into slush but it’s well worth the effort. This cool little accessory comes in a variety of cheerful colors that are perfect for summer. If real tools make you nervous for kids, the following pretend play kitchen appliances are so realistic that even parents will have fun playing with their kids. Using modern kitchen appliances can be tricky even for some adults so it can take a while for kids to be able to use them. However, with this kitchen set of blender, mixer and coffee maker, they won’t feel like they’re missing out! These toys run on batteries but work quite a lot like real appliances. For example, you can pour water into the coffee maker’s water reservoir up top and it will siphon through and dispense into the pot below once you turn the unit on. The blender with measurement markings actually runs with blades inside, so children can make pretend smoothies out of any mix of liquids. The mixer features interchangeable blades for mixing and there’s even a pulse control button. Each unit makes the appropriate working sound too! One of the best ways for kids and adults to learn a little bit about the science of food and cooking is to actually make things that most people normally buy from the store. Most kids like to eat cheese but they are sure to find the process of making cheese quite fascinating with this value for money Mozzarella and Ricotta cheese kit. It includes enough ingredients to make 30 one pound batches of delicious cheese! Included in this kit is citric acid, tablets of vegetable rennet, cheese salt, a yard of muslin for straining, a thermometer and a recipe booklet. The only thing you have to buy in addition is the milk that will be transformed into cheese. The included instructions are a bit complicated for kids to follow but an adult can help them break things down into a simpler process. There’s no better way to get kids interested in eating and cooking herbs and vegetables than to get them involved in gardening and growing them. If they’re encouraged to grow their own herbs, fruits and vegetables, right from planting the seeds to watering them and watching them grow before plucking them, they’re less likely to be fussy eaters and will learn to respect food and eat healthily. The Zziggysgal herb set of seeds includes 12 culinary herbs and 4 bonus flowering plants, while the Zziggysgal vegetable set includes 12 heirloom varieties of vegetables. Each type of seed has been tested and is guaranteed to grow. These two sets of seed kits are especially good for kids as they come in kid friendly packaging with an easy-to-follow illustrated instruction booklet that includes the uses and benefits of each type of herb. To make identification of each plant easy, you also get plant markers for each type. Kids can learn about solar thermal power and how food can be cooked using it with this Solar Cooking Science Kit. It includes parts and instructions to make a parabolic solar cooker that, when set up, can be used to warm water or melt chocolate to make an environmentally friendly dessert. The way it works is that the included foil pieces are formed into a parabolic shape that directs the sun’s rays to a cooking utensil holding the food to be warmed. The concentrated heat is enough to heat up a hot dog, melt chocolate, heat water, etc. It’s a great little science project that should be done outdoors and is perfect for a fun camping trip. ← Which is the Most Accurate Food Scale?